During ski season there are a number of crucial accessories you need for a great time on the slopes. One of those accessories is a good pair of ski goggles--with so many different lens types and tints, extra features, and prices it can be hard to know which pair best fits what you need. This buying guide will tell you everything you need to know to choose the best pair of ski goggles for you and help you to be prepared the next time you go skiing. 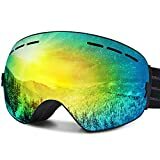 Depending on the conditions on the slopes and different features ski goggles differ based on the tint color of the lenses. The different colors filter in different amounts of light in what is known as Visible Light Transmission (VLT). Lighter tint lenses: Goggles with lighter tint lenses have higher VLT, which means more light passes through them. These goggles are most suited for cloudy, foggy days with poor visibility. 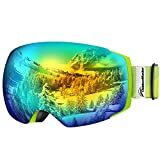 Pink, red, amber, yellow, and green lenses are all lighter tint ski goggles. Darker tint lenses: Goggles with darker tint lenses have lower VLT so you have maximum visibility on a sunny day with bright blue skies. Brown, grey, dark green, blue and mirror lenses work best on clear days. Clear lenses: Clear lens goggles are best for night skiing because they offer maximum visibility and light transmission when it’s dark on the slopes. Visibility: Reviewers rated highest ski goggles with anti-fog technology and clear optics for optimal visibility on the slopes. Ventilation: Reviewers prefer the ski goggles that have good ventilation to prevent against fog, but still stay relatively warm inside. Fit: The top-rated ski goggles fit comfortably across the face and back of the head and rest right below the helmet. Some reviewers note that they are most comfortable in the goggles that fit precisely with the helmet. Durability: Consumers prefer ski goggles with scratch-resistant lenses for added protection against the elements. 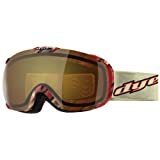 These goggles also last longer over multiple ski seasons and use. 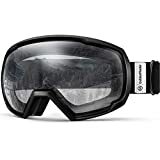 The weather conditions, climate, and visibility on ski slopes will be different depending where you ski so your goggles will need to be best suited for those conditions. When buying ski goggles it’s important to choose the right lens tint for wherever you plan to do the most skiing. If you do a lot of skiing in varying conditions then consider goggles with interchangeable lenses. This will give the most diversity to your goggles without needing multiple models. 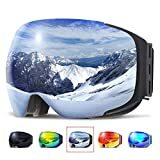 Keep in mind when buying goggles that they should be compatible with the helmet as well. The ski goggles and the helmet should line up to each other on the forehead for the best fit and protection. Ultraviolet ray protection is crucial for eye safety and preventing long-term damage to the eyes. To avoid sunburn opt for ski goggles with protection against UVA and UVB rays. 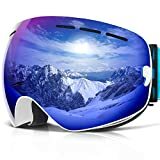 Safety should be top priority when skiing and ski goggles with double layer padding to protect the outer eye socket will give the best protection to your eyes. Lenses made out of polycarbonate will be more resistant to impact in case of a bad fall on the slopes. 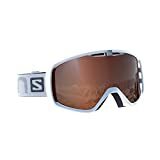 Some ski goggles also have nose guards designed for warmth and added facial protection. Some added features to consider for lenses are anti-fogging lens protection or ventilation, polarized lenses to block out any glare, scratch resistant coating, and curved lenses for better peripheral vision. If you wear glasses look for OTG (over the glass) style to accommodate your prescription lenses underneath the goggles. 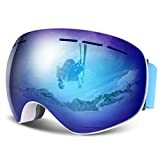 This is a far less expensive option than prescription ski goggles and OTG goggles have channels to hold the arms of your glasses and keep them comfortably and safely in place. 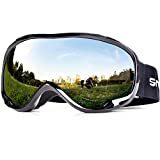 Smith: Smith Optics has been revolutionizing and innovating the experience of skiing since it invented the first-ever goggle with a sealed thermal lens and breathable foam. The company continues to make top-quality products and has patented its ODS (Ocular Docking System) prescription insert for ski goggles. Spy: Spy Optic snow goggles feature happy lens technology--color and contrast enhancing lens for maximum visibility and minimum fatigue. The company has been pushing the boundaries of eyewear technology since it was founded in 1994. Oakley: Oakley was created for world-class athletes and the company has numerous patented technologies. It is known for its innovation in sport eyewear in more than 110 countries worldwide. Oakley ski goggles are known for their ultra clear optics and anti-fog technology. Bollé: Bollé was founded in 1900 in France and has been creating eye and head protection equipment for sports ever since. 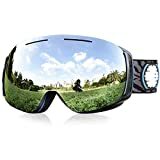 It seeks to improve your skiing experience by protecting your eyes in its best ski goggle technology.